1. Grasp a dumbbell with palm facing in. Rest the opposite hand and knee on a bench, keeping your spine straight and just above parallel to the floor. 2. Pull the dumbbell vertically upward alongside your torso, raising the elbow as high as possible. 3. 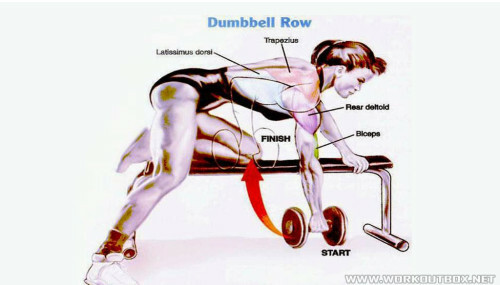 Lower the dumbbell down to the start position. Secondary: Trapezius, rhomboids, rear deltOid, erector spinae, biceps. Grip: A neutral grip with the dumbbell parallel to the torso works best. The dumbbell will tend to jam against your torso if a pronated or supinated grip is attempted. Trajectory: Pulling the dumbbell toward the chest works the upper latissimus and lower trapezius. Raising the dumbbell through a lower trajectory toward the abdomen targets the lower lats. Range of motion: Maximize the range of motion by stretching the latissimus at the bottom and raising the elbow as high as possible at the top. Body position: With your torso supported on the bench, stress through the spine is reduced.